Experience the multisport lifestyle by racing, volunteering or spectating at any global World Triathlon Corporation series race! Races include 5150 Olympic, 70.3 Half Ironman, and Full Ironman distances. Choose from nearly 100 worldwide travel destinations in the USA, Europe, Asia, Africa, Australia or North & South America. The Bozeman Triton Triathlon Club will cover $750 of your expenses. Expenses include entry fee, travel, accommodations, or related expenses, etc. Be creative and build your own personal dream Ironman Adventure Package. Get inspired and share your story with us! Get technically cool his and her eyewear and assorted triathlon gear! Two pairs of Rudy Project Sunglasses (Wizaard and Ability), TriSwim shampoo, conditioner, body wash and lotion, 2 fast dry towels, TriSlide, Foggle wipes, Finis swim caps, Finis baseball hat, Camelback Hand Hydration, Bangtail Bike Shop water bottle, 10 pack of Chamois Butter, Montana Huckleberry flavored Hammer Nutrition Gel and Hammer flask, Bozeman Running Company Socks. Let’s go camping! REI Half Dome 2 Plus 3-Season Tent, 2 REI travel pillows, 2 REI insulated mugs and, of course, s’mores.  Bozeman Triton Triathlon racers and volunteers will receive one free raffle ticket.  Additional raffle tickets are available for purchase by the racers, volunteers, and general public.  The price of a single ticket is $1.  Larger quantities of tickets may be purchased 6 for $5 and 25 for $20.  Tickets will be on sale at the East Gallatin Recreation Area Friday, July 29th from 4-6pm, Saturday, July 30th from 7am-5pm, and Sunday, July 31st from 7-11am.  The drawings for the Grand Prize, Second Place and Third Place Prizes will be held as part of the Sprint Triathlon awards ceremony on Sunday, July 31st (around 11:30 am).  The winners of the Grand Prize, Second, and Third Place Prizes do not need to be in attendance to win these prizes.  The drawings for the Other Cool Prizes will be held during both award ceremonies on Saturday and Sunday.  Winners must be present to claim the Other Cool Prizes. If no one claims a prize, then another raffle ticket will be drawn.  Bozeman Triton Triathlon Race Committee members are ineligible for prizes.  The Ironman Adventure Package must be used by December 31, 2012. 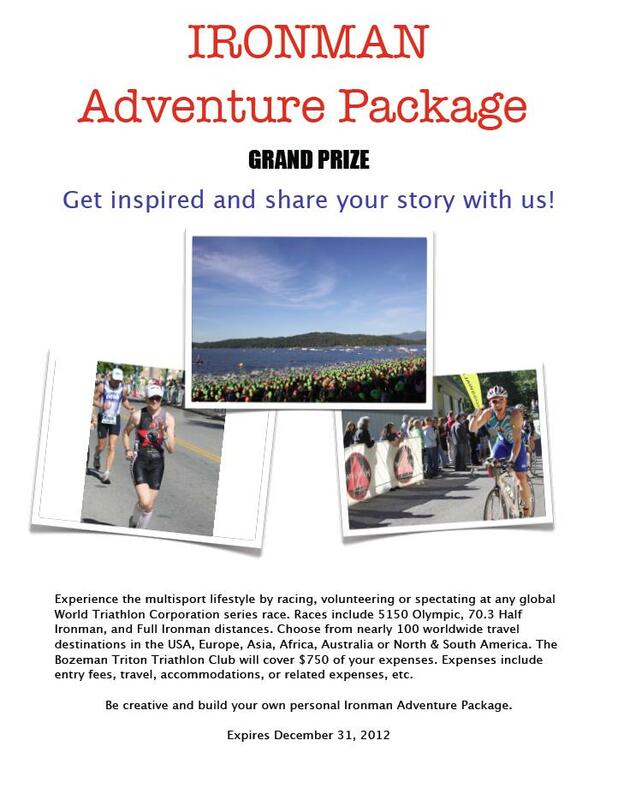  To receive the $750 Ironman Adventure Package award, the winner shall provide a brief description of their proposed Ironman Adventure and upon actually experiencing the Ironman Adventure share their story with the Club. PROCEEDS FROM THE BOZEMAN TRITON TRIATHLON SUPPORT THE SPORT OF TRIATHLON IN OUR COMMUNITY, MONTANA CONSERVATION CORPORATION, EAST GALLATIN RECREATION AREA, BOZEMAN MASTERS SWIM CLUB AND THE BOZEMAN TRIATHLON CLUB (“TRITONS”). Thanks to all of the participants, sponsors, and volunteers. We deeply appreciate your support. The Bozeman Triathlon Club is fueling the multisport lifestyle here in Bozeman, Montana!